So I just missed the blooming of the skunk cabbage this year. In fact, I’ve never seen it. The photo in my previous post was taken in the Native Flora Garden at the Brooklyn Botanic Garden on Tuesday; there were just a few post-bloom leaves there. The pictures in this post come from today on Staten Island. To the right of the leaves is what remains of the spathe, the green-purple leafy hood that encloses the spadex and emerges before the leaves. Its decomposing now. 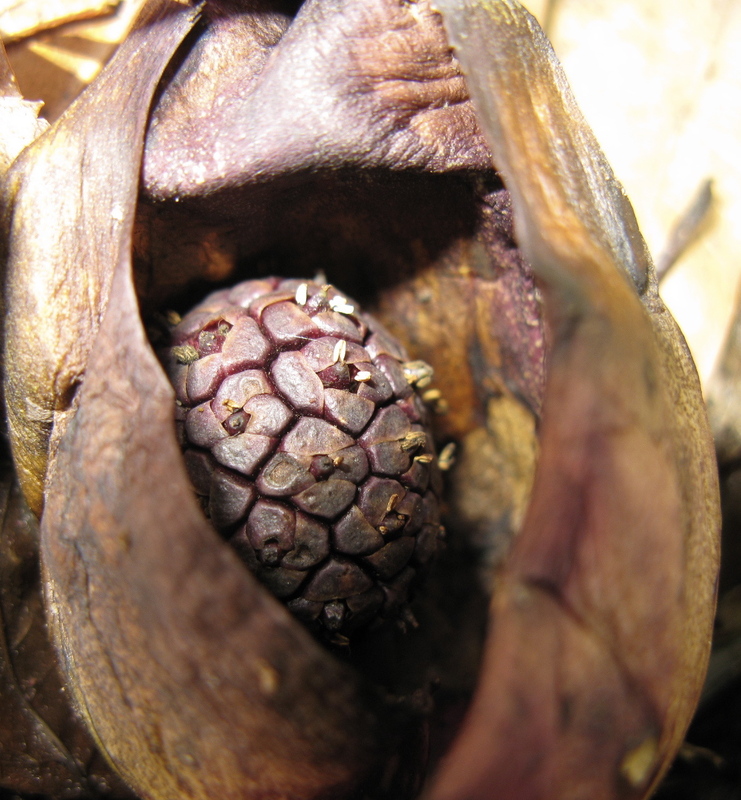 Here’s another where we can see the spadex within the spathe. The spadex, a fleshy spike, has a dense cluster of small flowers at its top. These and the enveloping spathe emerge from deep fleshy roots. So, emerging very early, sometimes through the snow, which, as we saw in our last post, the plant can actually melt, the plant attracts the earliest winged pollinators, usually flies of various kinds, by smelling akin to carrion. Ummmmm. Alas, or thank goodness, the spadex here was past its rotten prime and didn’t smell at all. 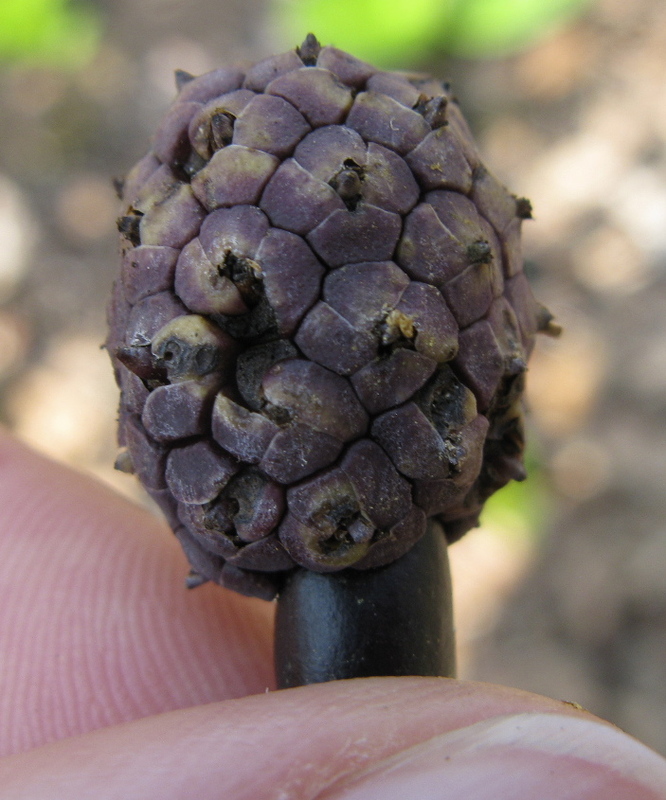 Indeed, the flowers, now fertilized, have produced the seeds you see here still clustered on the spadex. There are lots more details here. The leaves of the plant give it that skunky odor, which I kind of enjoy. Next year, in Staten Island, for the blooming. Growing up in North Jersey, we used to have skunk cabbage wars – breaking off the new leaves and whipping each other with them as we chased each other through the woods. Now that sounds like fun. I wonder if kids still do that? Are they even allowed to roam in the woods now? 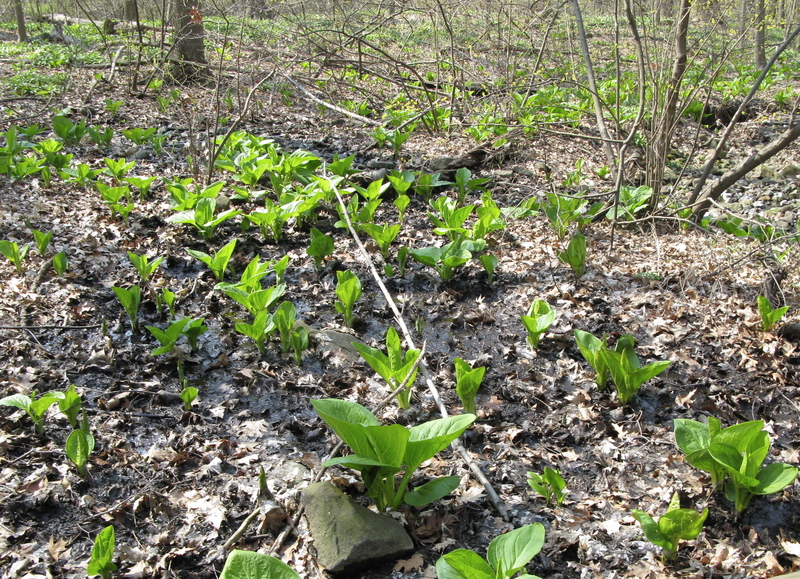 This particular batch of skunk cabbage heaven is owned by the state, and the state is always receiving calls from people who want to turn it into a ballfield. Luckily, it’s wetlands, so no development. Thanks for the link to your friend’s study. Some great info. Can’t believe I’ve spent all these years in ignorance about them. They burn as much oxygen when heating up to break through the snow as a small mammal! 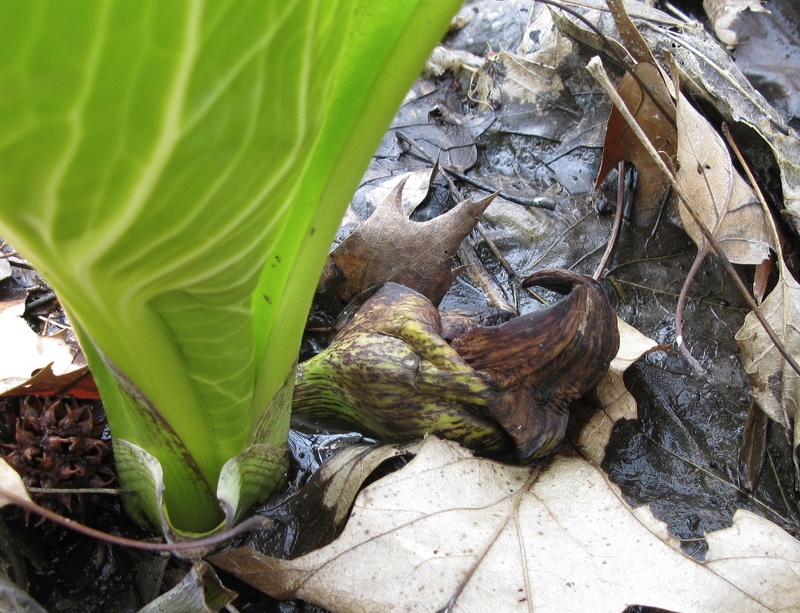 Skunk cabbage–I have seen it in “bloom” when I was a child in long-ago upstate NY, but I cannot remember the smell at all. I too wonder if any children are allowed to roam the woods, and are there woods for them to roam? I still can’t get use to seeing childless streets (except walking to school, or more likely, walking from the school bus. Not to mention the absence of dogs. What I love are marsh marigolds, haven’t seen any in years. None in my little bit of Ohio woods but there used to be some down by Dry Creek. To glance over there while driving is too dangerous at my age. I’ve never heard of skunk cabbage before. It’s so funky!